1, 2 and 4 string Gold Nana Bracelets shown. 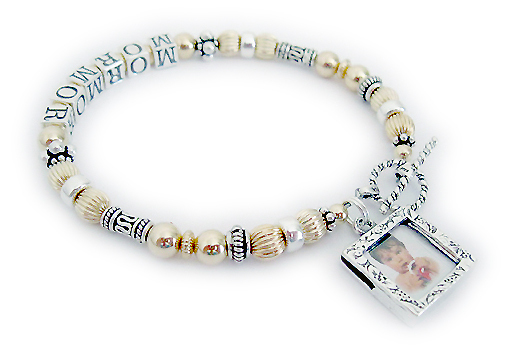 The bracelet shown is a 1 string gold NANA bracelet with 4 names: LILLIAN BEN MAX WADE. They chose one of my beautiful and free Twisted Toggle clasps. Details: I have used 14k gold-filled round 6mm beads and between the 14k gold-filled 5mm saucer beads and 5mm sterling silver daisy beads. You may have as many letters as will fit on this design. Questions: call or text me 615-490-2177 with questions or to place your orders. They chose one of my beautiful 14k gold-plated lobster claw clasps. Which means Mother's Mother in Danish. They add a March or Aquamarine Birthstone Crystal Dangle to their order. It is shown with one of my free simple beautiful sterling silver lobster claw clasps. 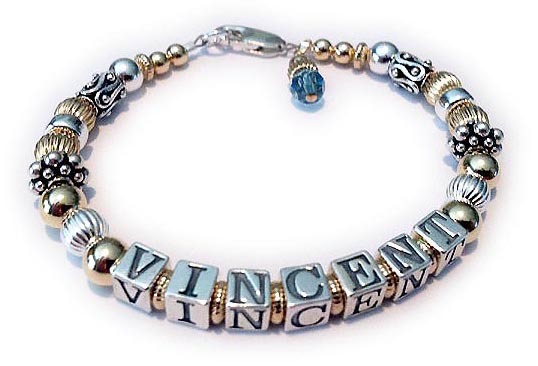 This is a 1- bracelet with 2 names. 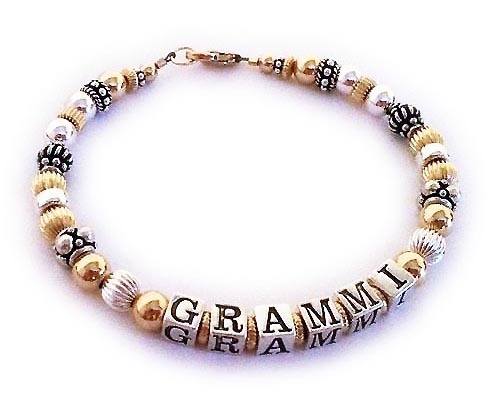 This is a 1-string Gold Grandma Name Bracelet with Camren and Connor and November or Golden Topaz Swarovski crystals before and after CAMREN and March or Aquamarine Swarovski crystals before and after CONNER. 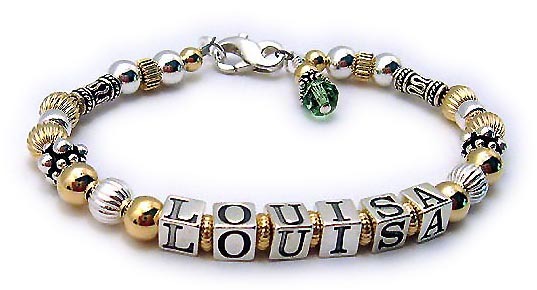 This is a 1- bracelet with 1 name. 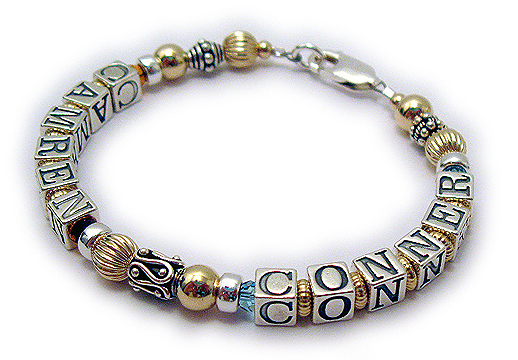 This is a 1-string Gold Grandma Name Bracelet with LOUISA. They added an August or Peridot Swarovski Crystal Birthstone Crystal Dangle and picked one of my beautiful, free sterling silver lobster claw clasps. 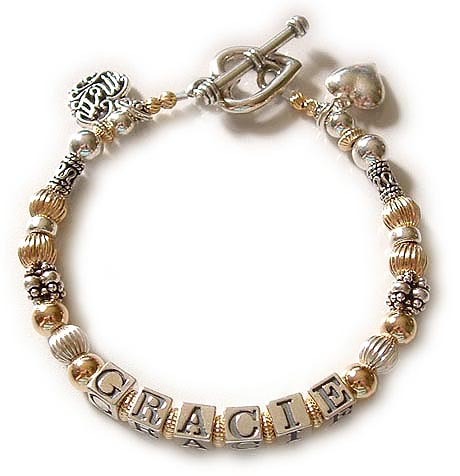 This is a 1-string Gold Mothers Name Bracelet with GRACIE. They added a Filigree MOM charm, a Puffed Heart charm and they upgraded from the free lobster claps to a Heavy Heart Toggle clasp. 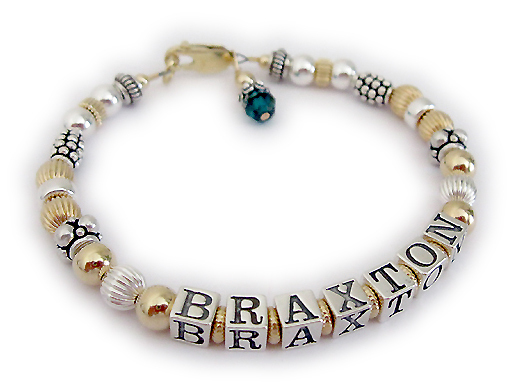 This is a 1-string Gold NANA Name Bracelet with BRAXTON. They added May or Emerald Swarovski Crystal Birthstone Crystal Dangle charm and upgraded to a 14k gold-plated lobster claw clasp. 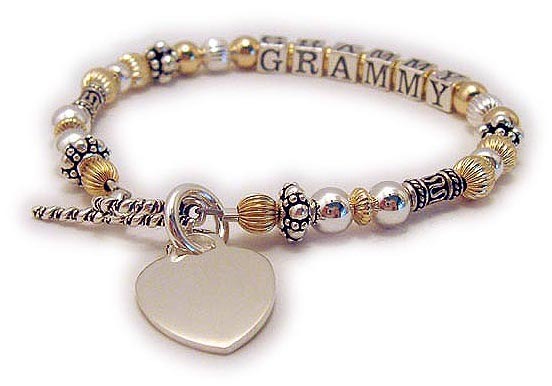 This is a 1-string Gold Grammy Name Bracelet with GRAMMY. They added a Heart shaped Engravable charm. I don't have an engraving machine so they will take it to the engravers when they get it in the mail. They also picked one of my beautiful free Twisted Toggle clasps.